The vibe I got when I initially listened to Wintersun’s first (and sadly, at this point in time, only) album recently returned to me for the first time in nearly five years. Surely anyone who’s listened to that album and loved it knows the feeling – it’s a sensation that you’re listening to something totally unique, painstakingly written and performed, and essentially impossible to pin into one genre. The return of that sense of awe at a totally unimaginable musical feat came with the very album I’m reviewing here: Auvernia’s sophomore effort, Afraid of Me. Unlike Wintersun, however, this band doesn’t have a prominent label like Nuclear Blast backing it up. Hell, Auvernia doesn’t belong to any label at all. And it’s baffling. For one, it’s a marvel that such an incredible band isn’t being hurled record deals left and right. Then there’s the fact that Afraid of Me’s presentation is of the utmost quality. From the beautiful cover art to the near-flawless production job, Auvernia gives off an air of professionalism that I’ve never seen before in an unsigned band. Then again, an album as out-there and experimental as this one is rarely seen on major metal labels, and perhaps Auvernia’s refusal to fit into any one (or even three) sub-genre may be what’s driving record companies away. Or it could be the fact that this metal oddity from Argentina is relatively unknown at this point. I have yet to come across one metal fan that has heard of Auvernia. But enough of that; let’s talk about the music. Christ, where do I even begin? Afraid of Me is a highly progressive and symphonic album, but inside this framework one will find a myriad of styles to accompany all tastes. 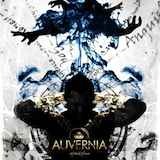 If I were forced to label it in as few words as possible, I’d dub it Progressive / Symphonic Power Metal / Melodic Death Metal, but when there are touches of folk metal, black metal, jazz, and several variations of traditional prog to be found, doing so would only begin to scratch the surface of Auvernia’s sound. The most incredible thing about the band’s eclectic style, however, is the fact that every component comes together perfectly into one style that is unmistakably the band’s own. Power metal choruses will plunge into complex prog runs and emerge on the other side as full-on aggressive melodeath, yet it all has a unique spin that is undoubtedly unique to Auvernia. I simply cannot compare Auvernia to any other band. Despite this melting pot of styles, the components of the music are focused and easy to describe, even though there are countless things going on at any given time. The drums are overall very fast paced (yet rarely revert to pointless blast-beats) and the keyboards display complex lines at every turn. The background orchestral keyboard work that flows throughout Afraid of Me is remarkably well done, and lends the album a level of bombast that is at times fist-pumpingly brilliant. Guitars constantly chug out fat, low, galloping riffs (whenever they’re not performing complex licks or solos), and the vocals regularly swap between clean and harsh singing styles. The harsh vocals are quite good, especially since there are both death and blackened styles present, but the clean vocals leave something to be desired. They’re not necessarily “bad” – vocalist Fernando Varela makes good work of his singing style – but that style is a bit nasally and unfitting to the album’s epic nature. It’s rarely annoying, however, and this one small flaw is a minor detraction from what comes close to being a perfect metal concoction. I dare your adrenaline to refrain from flowing the first time you hear Anguish - if you’re into this sort of over-the top progressive metal, that is. Not once on Afraid of Me does it feel like Auvernia is simply going through the motions. They fit truckloads of riffs, melodies, and prog flourishes into every single song, and it will take many spins of the album for listeners to pick apart everything that is going on. Fortunately, Afraid of Me is not so complex that that it’s un-enjoyable until properly deciphered. My first listen of the album is now one of my favorite metal experiences. The ludicrously bombastic quality, the jazzy weirdness of the more off-beat prog moments… everything is borderline perfect. One weak song (the ballad Ode to Life) and underwhelming vocals are the only detectable flaws in what is otherwise a whirlwind of a progressive metal masterpiece. Progressive metal fans that like their metal loud, fast, and over-the-top must make Auvernia and Afraid of Me (check out their debut, too!) priority listening. Pros: Nearly everything. This album is goddamned brilliant. Cons: Ill-fitting clean vocals; the ballad Out of My Hands; I can't seem to find a physical copy of the album anywhere online.